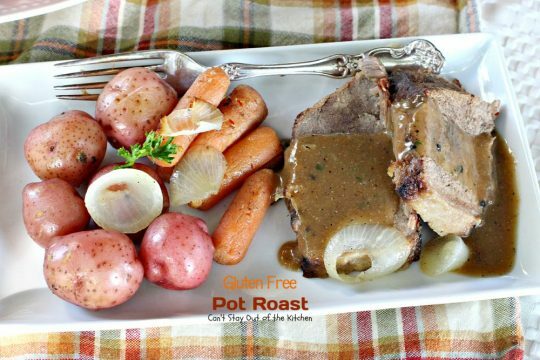 I love Gluten Free Pot Roast. The lovely taste of beef, potatoes, and carrots smothered in a rich, thick beefy gravy is simply amazing. My mom made this frequently when I was growing up. It’s such a wonderful comfort food especially this time of the year when the weather is cold. I enjoy making this wonderful dish to take as meals for new mothers or families in need of meals. 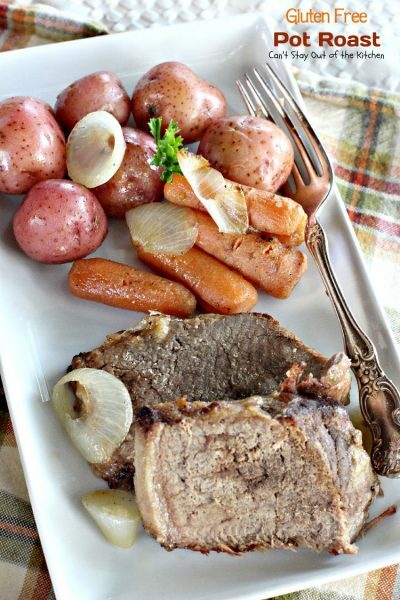 It’s so easy and everyone loves a pot roast supper. 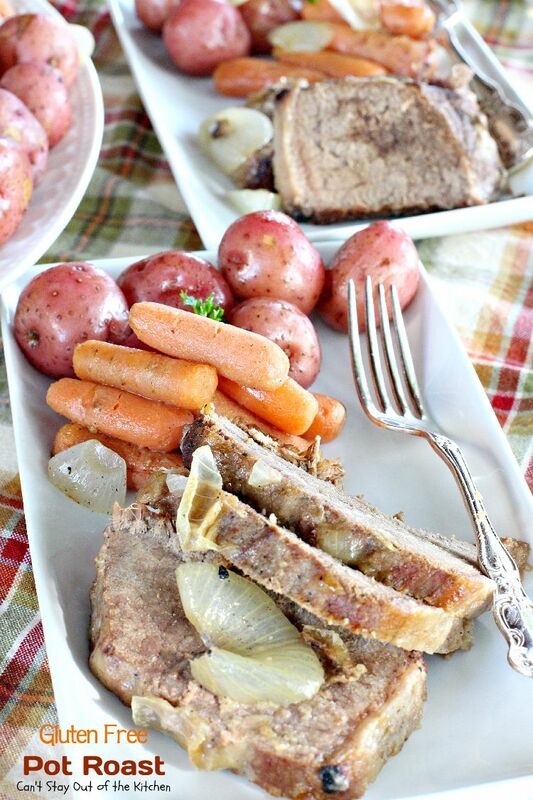 This great recipe can also be made in the crockpot just as easily. We’ve enjoyed it both ways many times. This is my Mom’s basic recipe made with gluten free flour instead of regular flour. I also add parsley and garlic powder to my gravy which I think gives it a little added zest to Mom’s plain salt and pepper seasoning. One of the secret ingredients to Mom’s gravies is Kitchen Bouquet seasoning. It’s a browning sauce that’s great for sauces and gravies. 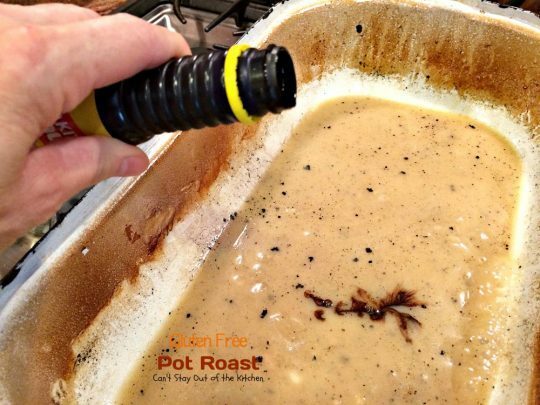 A few drops of that makes the gravy taste spectacular. 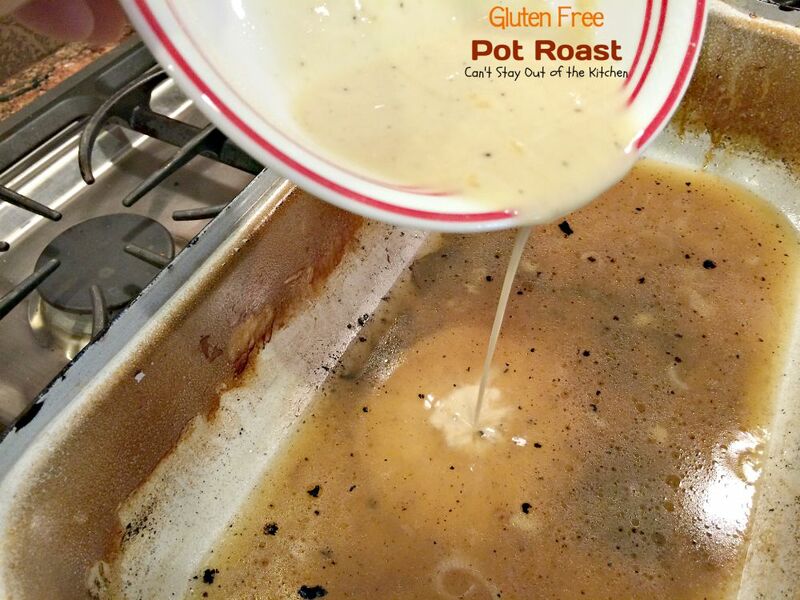 This easy gluten free recipe is so tasty your mouth will be watering as you look at the pictures. 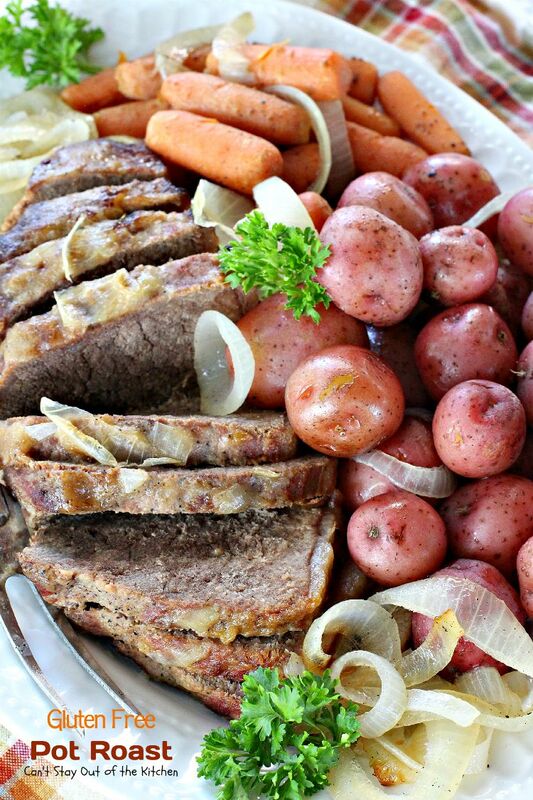 If you’re looking for a foolproof and fabulous pot roast recipe this is it. 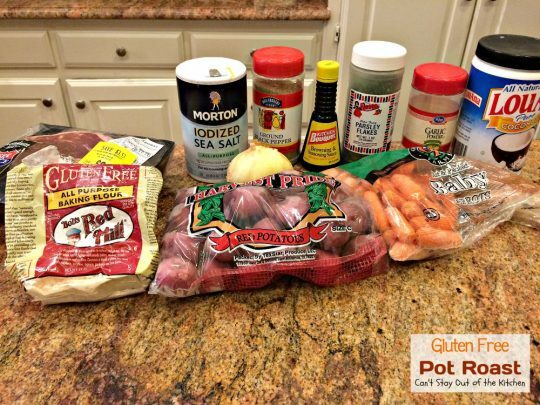 For those of you who are gluten intolerant or suffer from digestive issues due to gluten and are really missing some of those great family recipes, this recipe is for you. Enjoy! When I first posted this recipe in January 2013, it was before I had my large Canon camera. The pictures taken that first year of my blog were with an iPhone so they left a lot to be desired. I’ve been remaking all my first year recipes so I can retake the pictures so they will look more inviting and clear. I recently remade this recipe (July 2015) and took some new pictures. 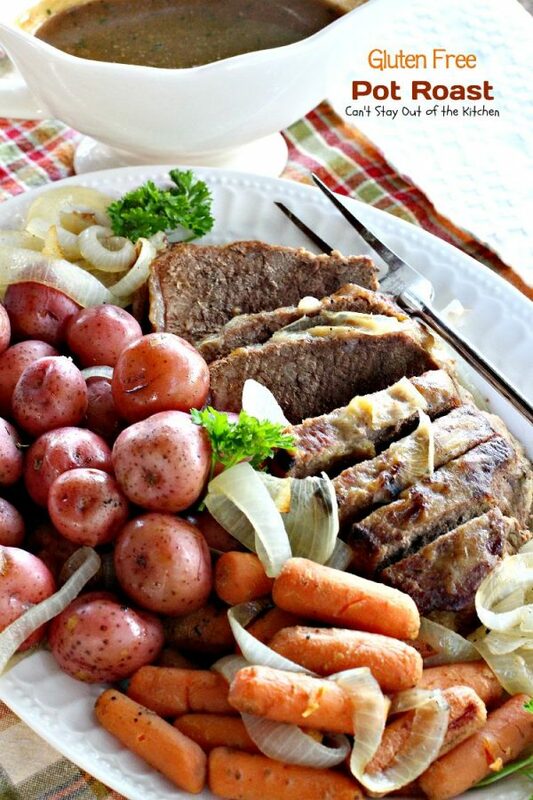 I still love eating my Mom’s Pot Roast recipe, and substituting gluten free flour is great for those with gluten intolerance. 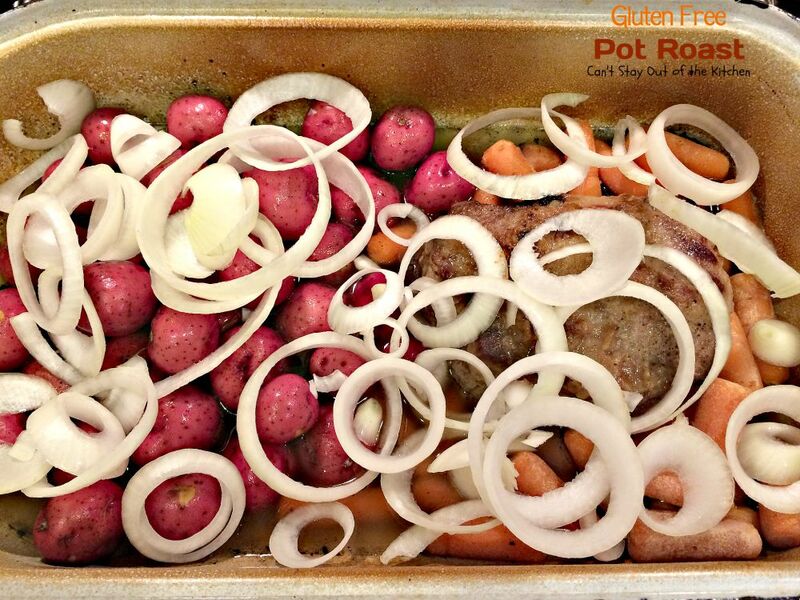 Doesn’t Gluten Free Pot Roast look gorgeous? 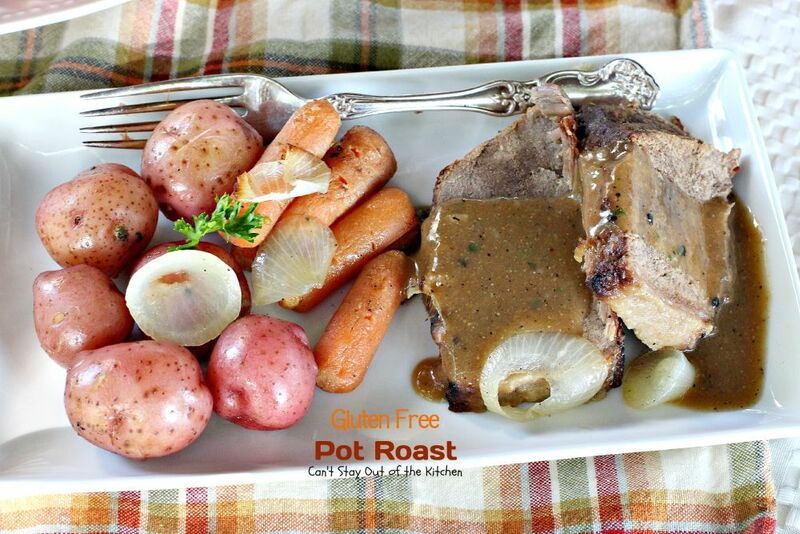 Here’s a simple, gluten free way to make pot roast, gravy, potatoes and carrots for a complete dinner. This delicious Gluten Free Pot Roast supper was incredible. I took my mom and grandma’s recipe and substituted gluten free flour. Same wonderful recipe but I used gluten free flour for those with gluten intolerance. Place a little of the gluten free flour on a plate. Place pot roast on top of flour and sprinkle heavily with salt and pepper. Turn salted and peppered side of beef upside down on top of the flour. Salt and pepper the top of the beef. 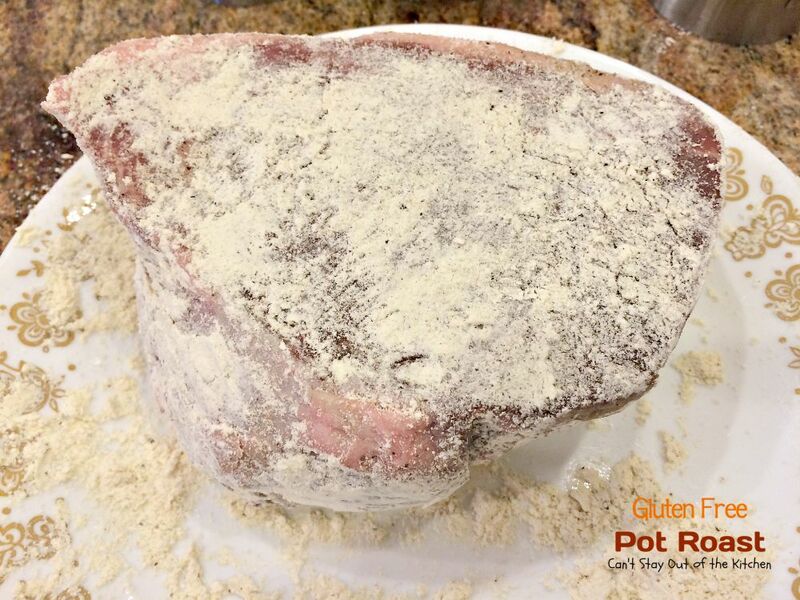 Dredge meat in flour and pat flour into the beef until all the beef is well coated. Place roasting pan over medium high heat. Add coconut oil. 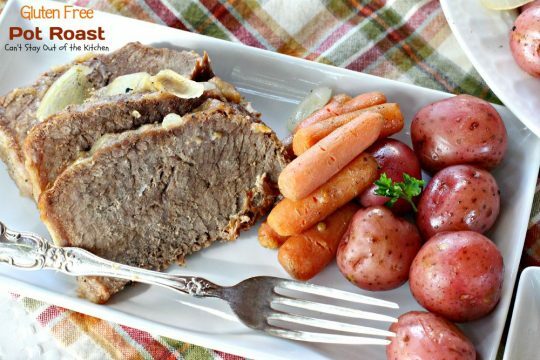 Place beef in hot oil in roaster pot. Cook until bottom is browned – about 5-10 minutes. With a large two-pronged fork turn meat over in pan over so the top side browns. 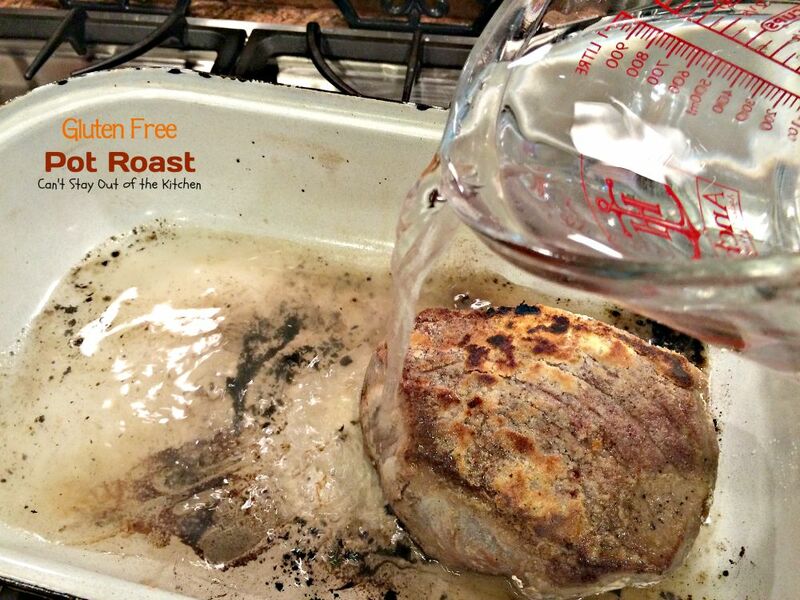 Once the meat is browned on both sides add 2 cups of water. Salt and pepper the water in the pan. Cover beef with lid. OPTION 1 – Oven method: Put in preheated 350 oven for two hours. 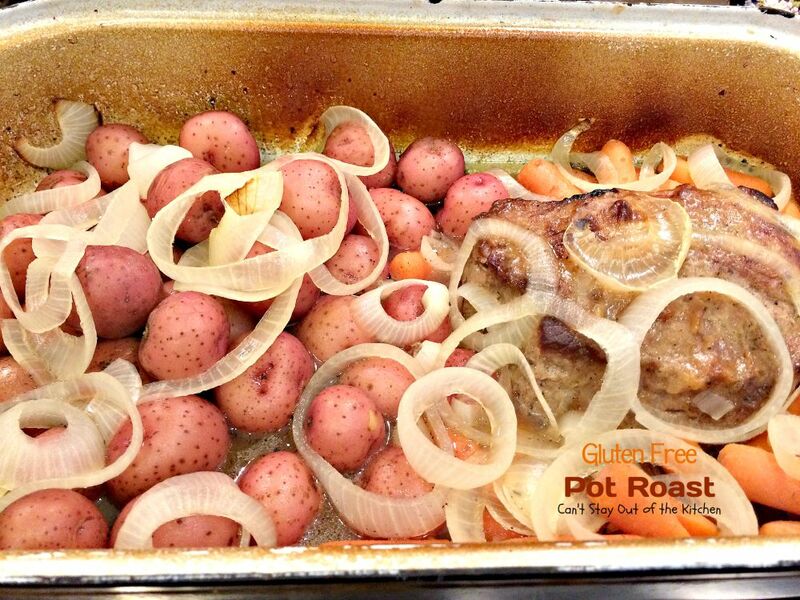 OPTION 2 – Stovetop method: you can also reduce heat and cook over stove top on low to medium heat for about 2 hours. You may have to add water occasionally if the water evaporates to prevent burning. After the roast has cooked about two hours add potatoes, carrots and onions. Sprinkle salt and pepper generously over veggies. Continue cooking about 1 to 1 1/2 hours for everything to cook through entirely. Test potatoes and carrots with a fork to see if they are done. Remove potatoes and carrots to a serving bowl. Keep warm in oven while cutting meat. 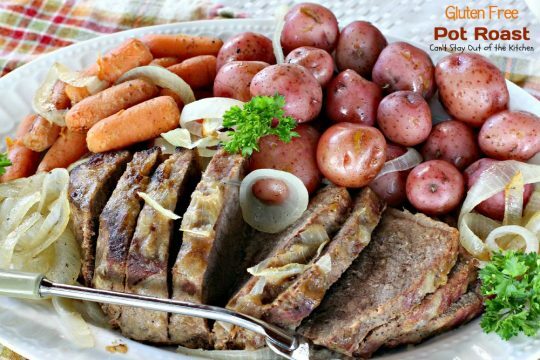 Remove beef to platter and slice down. To make gravy: Place the roaster with the beef broth on top of stove and heat to a boil. Whisk in gluten free flour mixed with water. Add a few drops of Kitchen Bouquet seasoning sauce. Add several shakes of garlic powder, and about a tablespoon or two of parsley to the broth. Season with salt and pepper to taste. If you add salt and pepper in the broth while the meat and vegetables are cooking you may not need to add much more. 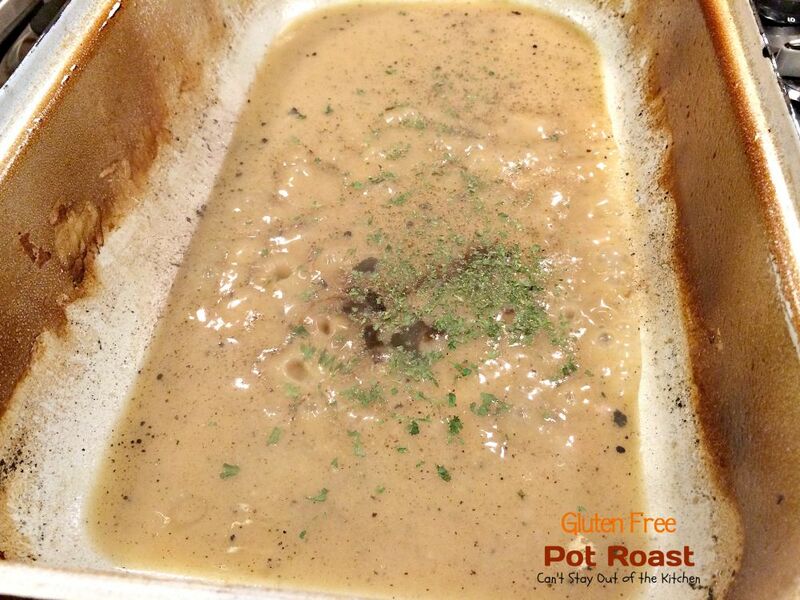 Bring gravy to a boil over medium heat and boil until mixture thickens. Check seasonings. Add salt, pepper, garlic powder, or parsley as desired. Add water as needed. 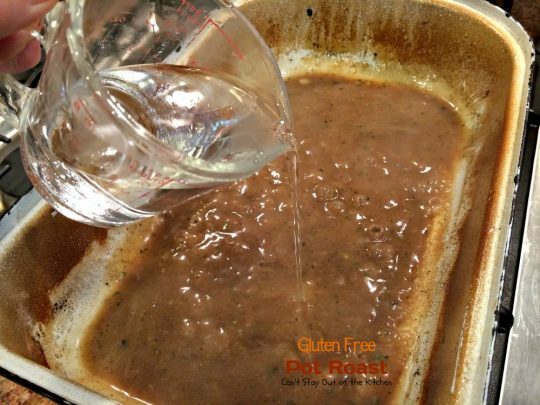 Keep gravy between low and medium heat while boiling. Be careful not to scorch the gravy by cooking on too high of heat. Here the gravy is done. Gluten Free Pot Roast is one scrumptious dinner meal. Here the pot roast is served without gravy. 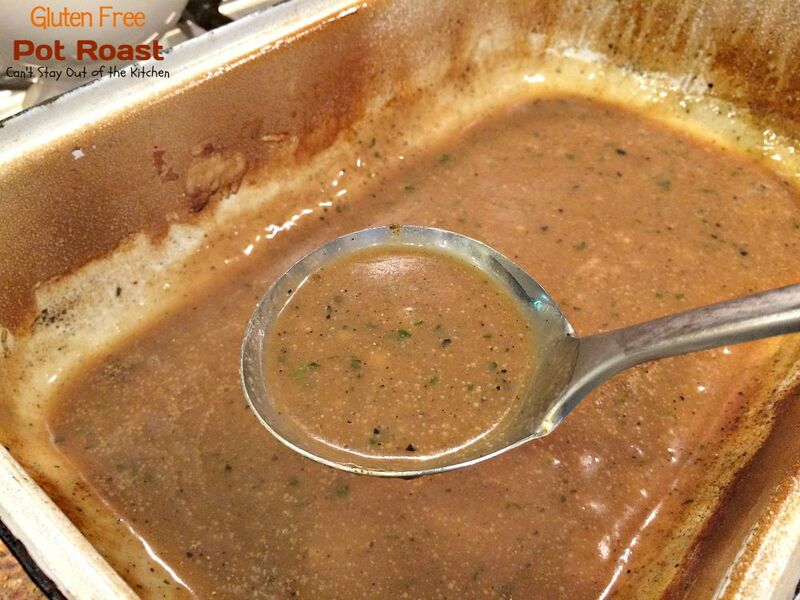 Serve gravy over meat and vegetables if desired. Old-fashioned pot roast dinner recipe given a new twist by substituting gluten free flour for the regular flour in the recipe. This family favorite is a great recipe for company. Put in potatoes, carrots and onions, if using. Remove carrots, potatoes, and onions to a casserole dish. NOTE: This can be prepared on top of stove just as easily and times will remain about the same. NOTE: To bake in crockpot, you will need to put in everything except the stuff for the gravy. That will have to be added at the end just like original recipe. Bake the meat about 3-5 hours on low (with water and seasonings), then add the vegetables for an additional 2-3 hours until cooked through. This can be prepared on top of stove just as easily and times will remain about the same. [br][br]To bake in crockpot, you will need to put in everything except the stuff for the gravy. That will have to be added at the end just like original recipe. Bake the meat about 3-5 hours on low (with water and seasonings), then add the vegetables for an additional 2-3 hours until cooked through. You and your family will love this delicious dinner. You can cook this in the crockpot easily too. 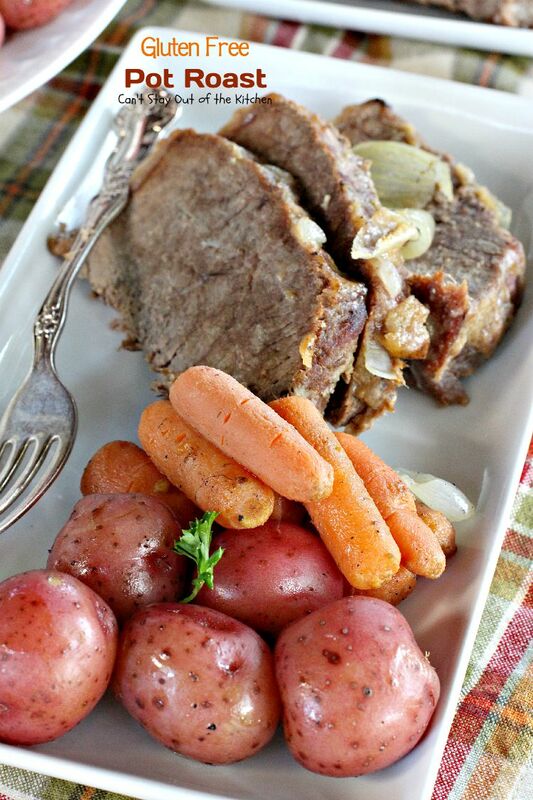 Gluten Free Pot Roast is a wonderful savory meal you’re family will really enjoy.